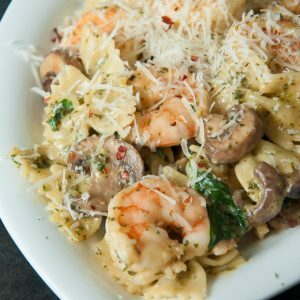 This Shrimp Pesto Pasta with Spinach and Mushrooms features tender pasta swirled with pesto, veggies, and perfectly sauteed shrimp. Everyone in my family loves this easy, yet impressive, weeknight dinner! When it comes to shrimp I’m a creature of habit. 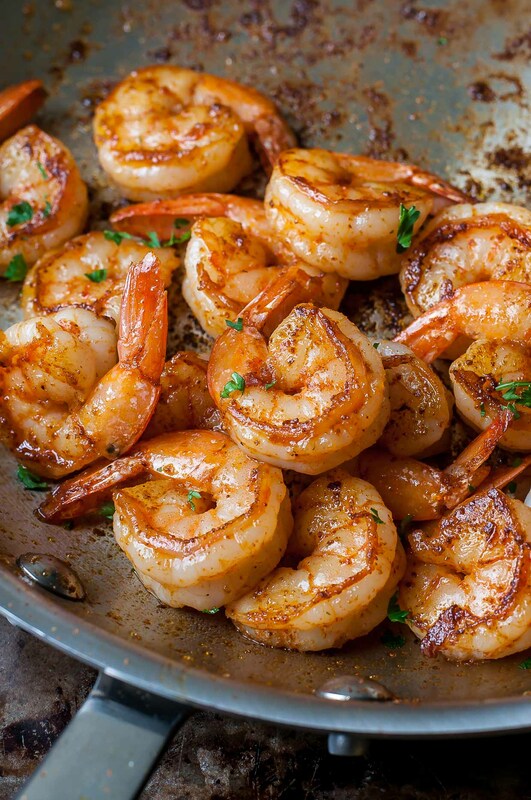 Though I love them fried, grilled, baked, and broiled, my absolute favorite way to eat shrimp is sautéed. Sautéing is quick, easy, and results positively perfect shrimp every time! Though I’ve been known to eat them straight out of the pan, I figured I’d keep up some sort of semblance of civility and provide you with a recipe for an actual meal, in case you’re in to that sort of thing. I’m pretty much known for this tasty plate-o-pasta swirled with pesto and flecked with veggies. 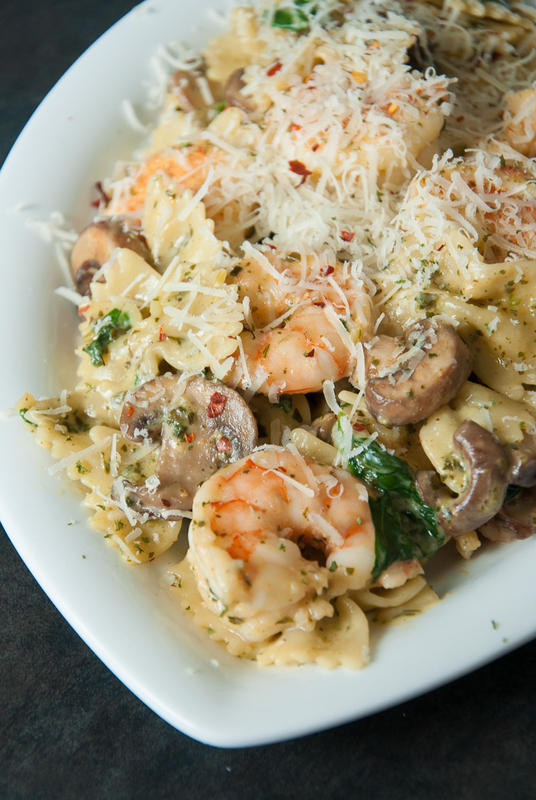 We make this tasty pesto shrimp pasta at least once a month! For extra buttery shrimp, feel free to add an extra tablespoon of butter. Craving spicy shrimp? Add cayenne pepper, red pepper flakes, or sriracha chili sauce. Add all three and you’ll basically need to dunk your face in a glass of milk. Have fun with that! For this recipe I’m using jumbo, frozen wild-caught shrimp. After defrosting the shrimp, you’ll want to rinse, devein, and partially peel the shrimp, leaving the tail intact. After defrosting, rinse the shrimp with cool water in a colander. To clean the shrimp, a small pairing knife will work, but OXO’s nifty shrimp cleaning tool will make the prep work a breeze! It’s perfect for someone, like myself, who has a sordid history with knife accidents. I’m downright clumsy. Grab your shrimp cleaner and insert it into the shrimp, lining it up where the vein starts at the head. In one fluid motion, push the tool through the shrimp [leaving about an inch above the tail] and yank upward, splitting the shell and removing the vein. If the shrimp has an extra long vein, simply pull it out now that it has been loosened and exposed. side note: if you’re looking for the tool I used, you can pick one up (here) – I adore it! 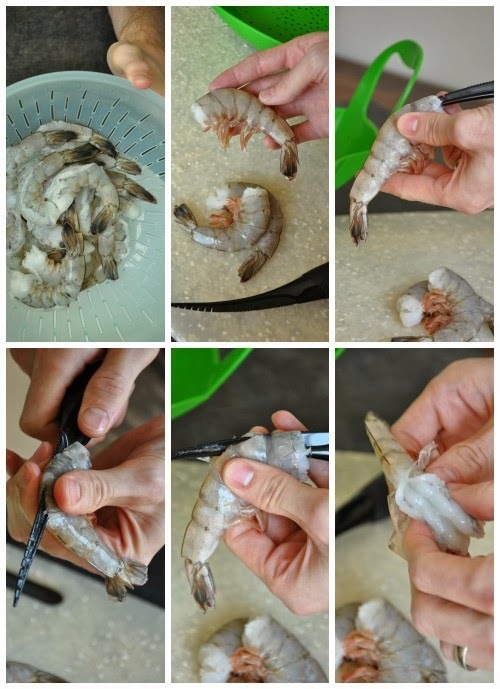 Now you should be able to easily peel off the shrimp’s “shell” and discard. To keep the tail on (this locks in extra flavor while cooking) do not peel the entire shell off. Towards the tail the shell forms into little hinges. Nearly an inch above the tail is the first hinge, use your thumb and forefinger to hold on to the hinge and snap it left to right to separate it from the rest of the shell. Then simply peel off the remainder of the shell. I probably over-explained myself, but this is essentially the quickest and easiest shrimp prep method I’ve used to date! Heat a pan/skillet to medium-high with a TBSP of butter. Once the butter starts to melt, add the shrimp and seasoning. Stir to coat the shrimp. Cook each side for about 2-3 minutes until shrimp curl and turn a pinkish-orange and opaque. The sauté time will depend on the heat setting you choose and the size of your shrimp, but regardless they’ll be perfectly cooked in a matter of minutes. If you’re a citrus junkie like I am, you can also add an optional burst of lemon flavor to the finished product before digging in! Now that we have a pan full of perfectly seasoned shrimp, let’s get some veggies in on the fun and make my famous pesto shrimp pasta with spinach and mushrooms! First prep your shrimp as indicated earlier in the post and set aside in a cool bowl with ice water while you cook your vegetables and sauce. Bring a large non-stick pan to medium heat and saute the mushrooms, spinach and garlic in a teeny drizzle of your favorite healthy oil, taking care not to burn the garlic. Drain, return to pot, stir in pesto, and set aside. Once the mushrooms are tender and the spinach has wilted, pour in your milk or cream and reduce heat to low. Add parmesan, garlic powder. onion powder, and paprika as well as any salt and pepper to taste. Simmer on low, stirring to combine the flavors and melt the cheese. I left the salt and pepper up to your own personal tastes just to be on the safe side. Some prefer a saltier pasta dish while others like to only add a pinch. I wouldn't leave it out [the salt helps further amplify the flavors of the dish] but simply choose your amount based on preference! The noodles and vegetable sauce should be done around the same time. Pour the sauce over the pot of pesto noodles and stir. Use your stove top's "warm" setting to keep the pot warm or use the lowest heat setting available. Quickly saute your shrimp [this should only take a few minutes] with butter and seasonings and add to the warm pasta and sauce. If you like your pasta piping hot, simply increase the heat a bit and stir constantly while it heats, adding the shrimp at the end. You can remove the tails before serving if you'd like or leave them on for presentation as many restaurants typically do. Up to you! Spoon into bowls or pile onto plates and garnish with freshly grated parmesan cheese and a pinch of red pepper flakes. Feeling saucy? If you prefer a saucier pasta bowl, double the milk/cream, add a little extra pesto, and add any extra seasoning to taste. Let your taste buds be your guide! Consider this comfort food with a twist. It's plate-licking good! 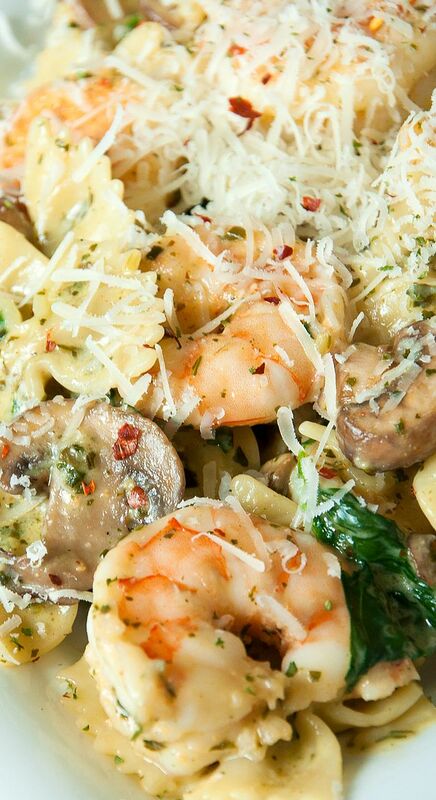 If you get a chance to try this tasty Shrimp Pesto Pasta with Spinach and Mushrooms, let me know! Leave some love in the comment form below or tag your photos with @peasandcrayons on Instagram so I can happy dance over your creation! This post contains affiliate links for products I use and adore. Made this last week and got a thumbs up from my husband. Each of us actually had two servings! I was looking for a pesto pasta dish and stumbled upon yours. The recipe is easy to follow… and I can also use the shrimp recipe for a simple sautéd shrimp with salad another day. Tks! Good flavor, however the cheese made the spinach stick together 🙁 but overall it was a win! Great recipe! Toddler approved as well, not a bite leftover. Thanks for posting! I love this pasta dish. It incorporates my favorite things- shrimp, pasta and pesto. I also love it because it is simple and easy to make. I featured it in my blog, Lisa living Life.com. I hope you will check it out ? made this last night and it was out of this world crazy good! Wonderfully rich and savory flavor without being heavy. My husband couldn’t stop raving about it and even added that he thought it would make a perfect dish for company! he’s right! I’m not a mushroom fan. What would you substitute? No worries Lindsey! You can use any veggie you enjoy! Sautéed or blanched asparagus would be a great addition as would broccoli, cooked your favorite way. You could even add extra spinach in place of the mushrooms – it’s super customizable! Hope you love it as much as we do! I’ve made it with broccoli and extra spinach a few times and really like it! Made this tonight and family loved it. Will be adding to dinner rotation – thanks! This turned out great! The kids loved it too! I made a few slight changes to the recipe. I used 1.25 lbs. medium shrimp, 5oz. bag of spinach, 5 oz. pesto (1/2 cup), 1/2 cup Low-Fat Half and Half, and 1 lb. pasta shells. I added half the spinach in with the mushrooms and then tossed the other half at the end of sautéing the shrimp (kept it a brighter green color). Might add halved grape tomatoes next time for added color. Yummy!! A definite repeat for us! Thanks for posting this amazing recipe .I made the recipe Today with everything but the spinach and it was amazing !! It was a crowd pleaser in the end . I am not a big pasta person but I could not help eating a good amount of it myself ! I’ve made this recipe at least 10 times. I’ve given it out to all my friends. This is just the BEST shrimp and pasta dish that I’ve ever made! The flavors sing! If you haven’t made it yet, do yourself a favor and GO FOR IT! Amazing dish. Kudos to Jenn – fabulous job! PS – I give it 10 out of 5 stars…. Found this on pinterest under low carb/diabetic meals…where is the nutritional count on this? I have a someone who has recently been diagnosed with type 2 diabetes. Learning to cook a whole new way. Made this tonight and it was a hit! I will be making this again for sure. Btw, I added this to my recipe box! I just made this dish for my boyfriend and I, what an amazing dish! We both loved it! holy holy yum. I need this! This is my go-to recipe for shrimp. I’ve made it at least 5 times. I just love the experience of eating this recipe – southern style spicy shrimp, creamy pesto, mellow veggies and pasta. It’s an explosion of taste on my fork. LOVE this recipe! LOVE your comment! Haha thanks so much Heather for the shining review! This was the first big kid dish my daughter tried and a total favorite in my home too! I’m so glad you love it! I made this tonight after pinning it some time ago. Needless to say, super easy and a HUGE hit in my house. Thank you for sharing!! This was AMAZING! Thank you for sharing I made it tonight and will for sure be making it again 🙂 two thumbs up! Haha I heart you and Stephie and I’m so glad you and Jerry loved the recipe! It’s on heavy rotation all year long around here thanks to my neverending supply of frozen pesto! <3 Mia is growing TOO TOO fast! I won’t even be able to call her a baby much longer. Ahhh! Make it stop! Eeee! So glad you loved it! Thanks Heather! O-M-G!!!! I made this today! This dish is SOOOO good! I’m scarffing it down while I’m posting this comment because I want you to know that this is my new favorite warm shrimp dish! WAAAAAYYYYY AWESOME!!! OH lordy…I’m drooling over this – and it’s not even 7 am yet. oh my….I want this so bad!! My family will love it. First of all…those pictures…oh my gosh why would I come here on an empty stomach?? Pinned! Secondly, is that giveaway tool free?? It’s awesome! I love shrimp, but I so detest cleaning them suckers! This looks fantastic! I will definitely be trying this. The shrimp look so tasty cooked like that! I can see why it’s your favorite. This looks like a fantastic comfort food dish! Drool! This looks so goooood! I want this for supper! Whoa, that sauteed shrimp looked amazing and then I saw the pasta. Want this so bad!